Our goal is to get your order out to you as soon as possible. 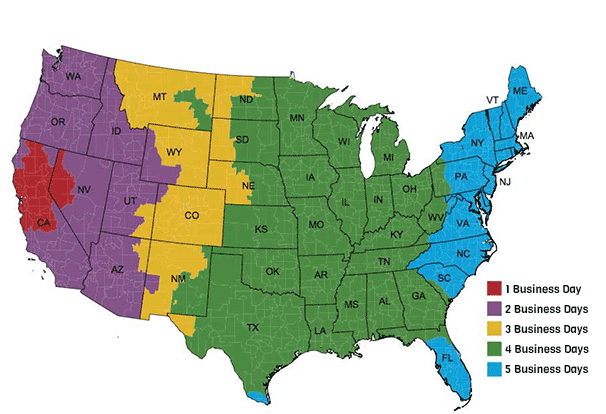 We ship our bedwetting products and supplies from fulfillment centers in California. All orders are subject to product availability and complete customer order, billing and shipping information being received by One Stop Bedwetting. Shipments are also pending weather restrictions or natural disasters. We offer many different shipping methods including USPS and couriers (FedEx/UPS/DHL) to ship both domestically within USA and internationally. Shipping rates are calculated automatically at time of checkout. To see the relevant rates, add the item(s) to your shopping cart and you will see the rates both when you view your cart and at checkout. The table below will provide information on when your order will ship. Economy and Get it Faster orders are processed by noon on business days. If you order Express Shipping before 3:00 pm PST on weekdays (excluding holidays), your order will ship the same day. You will receive e-mail confirmation with tracking information (when applicable) notifying you once your order ships. Note: Domestic express and overnight orders must be placed by 3:00 pm PST for shipment on the same day. Express and overnight orders received after 3pm PST will be shipped the next business day. The shipping option you select – i.e. ground, get it faster, express etc. All shipments with orders over $150 are automatically insured. You will need an adult to sign for orders over $150 on delivery. International express orders are shipped via FedEx Priority Express. International economy orders are shipped via USPS first class international mail. International customers are responsible for any customs charges or any export fees for importing from the United States. One Stop Bedwetting only covers the shipping costs. Cancellations must be made via phone at USA Customers: (800) 230-6775. Your order can only be cancelled before it ships. See the table above for estimated ship times based on when you place your order. Cancellations made after the scheduled ship time are not guaranteed and may not be accepted. Orders that have not processed and shipped will be fully refunded. Orders that have shipped cannot be cancelled and will need to be returned at the customers expense. See our returns and exchange policy. One Stop Bedwetting is not responsible for late cancellation notices and the customer will remain liable for all product and shipping and handling fees.